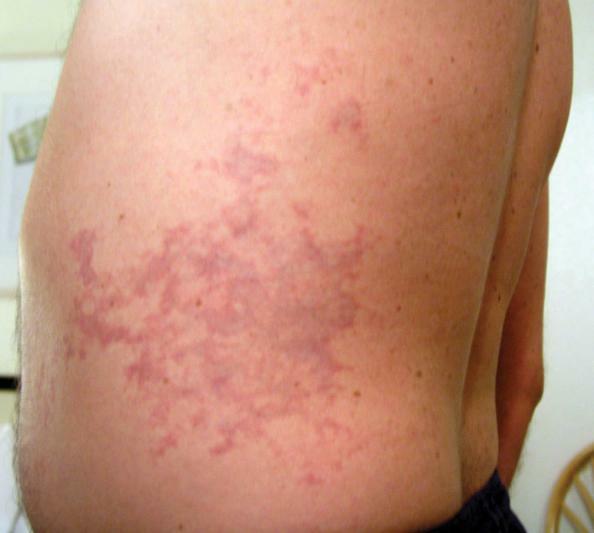 Skin mottling like this is characteristic of cutis marmorata, a condition that can warn of likely development of more serious Type 2 symptoms. The collective insult to the body's systems can produce symptomatic DCS. The condition's primary effects may be evident in the tissues that are directly insulted. Its secondary effects can compromise the function of a broad range of tissues, further jeopardizing the diver's health. The ability to recognize the signs, or objective evidence, and the symptoms, or subjective perceptions, of DCS — and to differentiate them from signs and symptoms less likely to be associated with DCS — is important. A variety of classification systems have been established for DCS. One common approach is to describe cases as Type 1 or Type 2. Common sites of musculoskeletal pain associated with Type 1 DCS. Type 1 DCS is usually characterized by musculoskeletal pain and mild cutaneous, or skin, symptoms. Common Type 1 skin manifestations include itching and mild rashes (as distinct from a clear mottled or marbled and sometimes raised discoloration of the skin — a condition that is known as cutis marmorata that may presage the development of the more serious symptoms of Type 2 DCS). Less common but still associated with Type 1 DCS is obstruction of the lymphatic system, which can result in swelling and localized pain in the tissues surrounding the lymph nodes — such as in the armpits, groin or behind the ears. The symptoms of Type 1 DCS can build in intensity. For example, pain may originate as a mild ache in the vicinity of a joint or muscle and then increase in magnitude. However, the pain associated with DCS does not typically increase upon movement of the affected joint, although holding the limb in one position rather than another may reduce discomfort. Such pain can ultimately be quite severe. 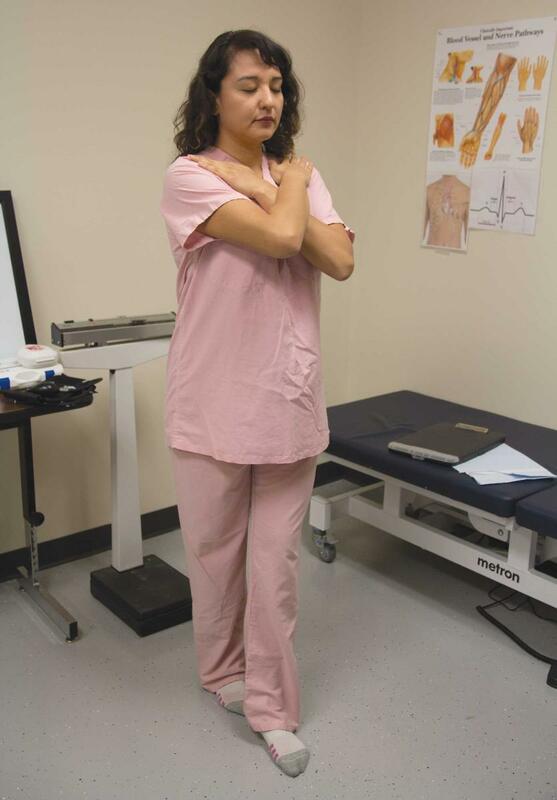 The Romberg test evaluates postural control. The sharpened Romberg, which includes crossing the arms and putting one foot in front of the other, is more sensitive to changes in static balance. problems with physical coordination or bladder control; paralysis; or a change in mental status, such as confusion or lack of alertness. Inner-ear symptoms may include ringing in the ears, known as "tinnitus"; hearing loss; vertigo or dizziness; nausea; vomiting; and impaired balance. Cardiopulmonary symptoms, known commonly as "the chokes," include a dry cough; chest pain behind the sternum, or breastbone; and breathing difficulty, also known as "dyspnea." 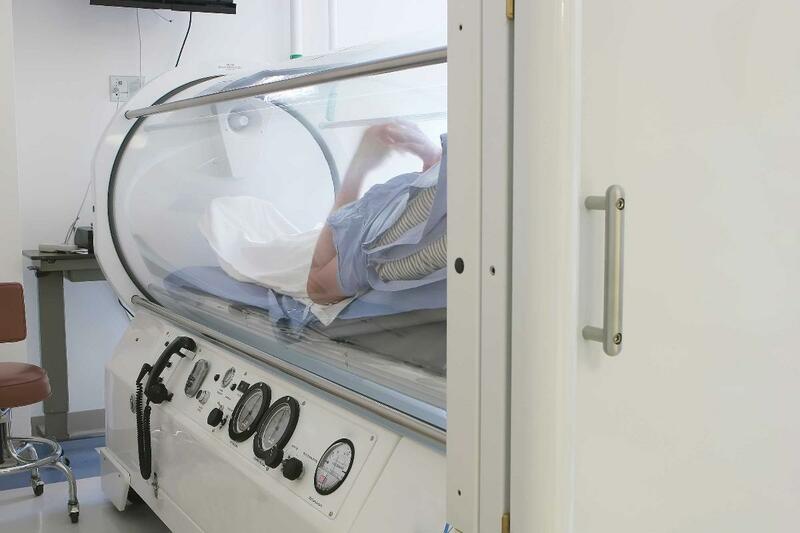 The respiratory complaints, which are typically due to high bubble loads in the lungs, can compromise the lungs' ability to function — threatening the affected diver's health, and even life, if treatment is not sought promptly. Type 2 symptoms can develop either quickly or slowly. A slow build can actually obscure the seriousness of the situation, by allowing denial to persist. For example, fatigue and weakness are common enough concerns, especially if their onset is protracted, that they can be very easy to ignore. Less common symptoms, such as difficulty walking, urinating, hearing or seeing — especially if their onset is quick — can sometimes prompt faster recognition of the existence of a problem. It is fair to say that divers can initially be reluctant to report symptoms, though they usually will do so if their symptoms do not go away. This is a shortcoming divers should be aware of, lest they fall prey to it. 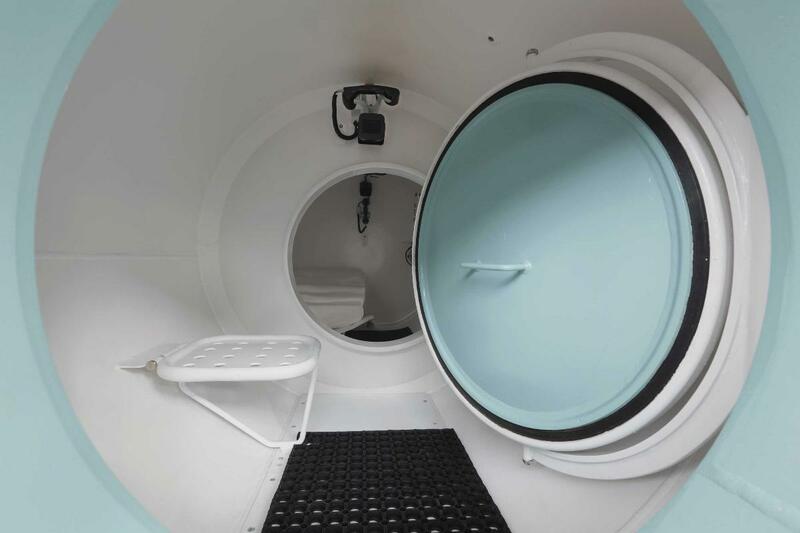 Monoplace hyperbaric chambers hold only the patient being treated. According to this recent review, pain and numbness, also known as paresthesia, were reported initially in nearly two-thirds of cases of DCS, constitutional symptoms in approximately 40 percent of cases, dizziness/vertigo and motor weakness in approximately 20 percent, and cutaneous symptoms in approximately 10 percent (Vann et al. 2011).